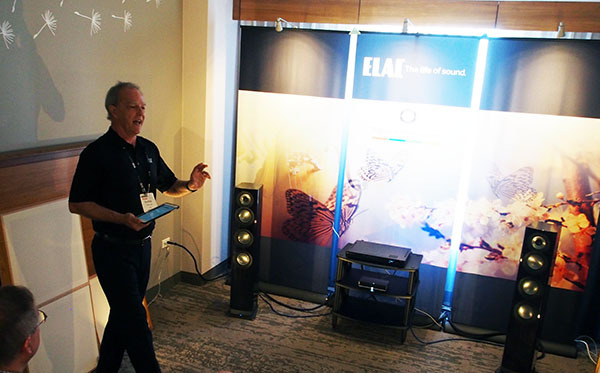 The first of the two ELAC rooms I visited featured the Navis ARF-51 powered tower speaker ($4000/pair). This design from Andrew Jones, shown in my photo, features a coaxial tweeter/midrange unit and three woofers. Level controls allow the balance to be optimized—up to ±1dB for the coaxial unit, up to ±4dB for the woofers. With source a Discovery server ($1099) and an Audio Alchemy DDP-2 D/A preamplifier, with AudioQuest Monsoon power cables and AudioQuest Water interconnects, the ARF-51s playing Count Basie’s 88 Basie Street sounded rich with clean, clear high frequencies. Despite the relatively small size of the room, the low frequencies didn’t sound boomy or out of control and the bass on a Dead Maus track hit me in my chest—that’s meant to be a complement.